NO NO NO, I did not just eat ice cream before 10:30 in the morning ...it was ...ummm ...the other Dubba. I'm sorry, I couldn't resist. I had an extra spot in my lunch bag so I brought in a Friendly's sundae to-go that I had in my treat box. I was going to save it for a rainy day, but unfortunately the sudden urge for chocolate and peanuts overcame me. 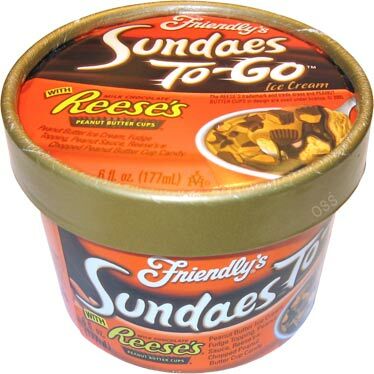 There are six flavors in all, and on the day I bought this Friendly's Reese's Peanut Butter Cup Sundaes To-Go, they were on sale for a buck a piece. Thoughts of a fresh Friendly's sundae danced in my head as I removed the plastic wrapper. I didn't really know what to expect, so I removed the lid and laid my eyes upon a bunch of pb cup chunks. They were sitting upon a layer of sauce, chocolate on one side, and peanut butter on the other. The layer was about an eighth of an inch thick. Under that lies a cup of very mild peanut butter ice cream. Wait, I think I've said that of just about every treat I've had this week. Anyway, I'm a sucker for frozen pb cup chunks, the sauces are ok, and like I said, the ice cream itself is mild. I definitely suggest trying to scoop up a bit of everything on every bite to maximize flavor. It's not bad in a pinch, but it's definitely not a trip to Friendly's. I only ate about 60% of it, so I'll second scoop in the afternoon and finish it off. On Second Scoop: Good thing I saved a bit for later. The first thing I did was take a bite of the ice cream, nothing else. Well, it's not the ice cream that's super mild, it's the sauces that are totally messing with my palate. The ice cream is mild, but in a good way. The problem is the pb is chalky and the fudge just ain't right at all.